Deal Students Cook Their Way to the Top | Tenleytown, D.C.
I’m a cooking competition junkie – Top Chef, Master Chef, Junior Master Chef, Iron Chef, The Taste – you name it, I’ve watched it. 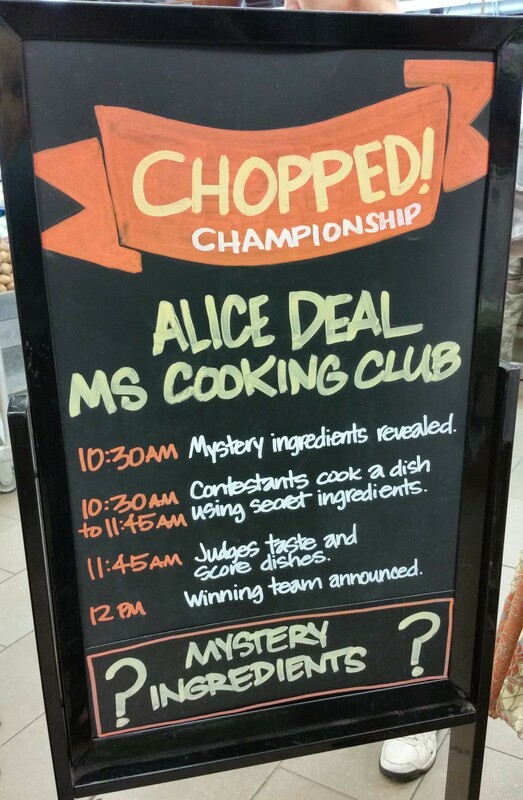 So, when I was invited to be a guest judge for the finals of Alice Deal Middle School’s “Chopped” cooking competition, I accepted immediately. Let’s face it – I was never going to get the call from Bravo!. This was my chance. For the past two years, with the leadership of teacher Harlan Kinzer, Deal has organized a cooking club for students in partnership with Whole Foods Market in Tenleytown. But this is not a home economics class of yesteryear. In its first year, the club delved into international cuisine, while this year the emphasis was on professional cooking techniques. Throughout, with support from Whole Foods, the students learned about making healthy eating choices, including choosing fresh, seasonal, locally sourced produce and reducing oil and salt. 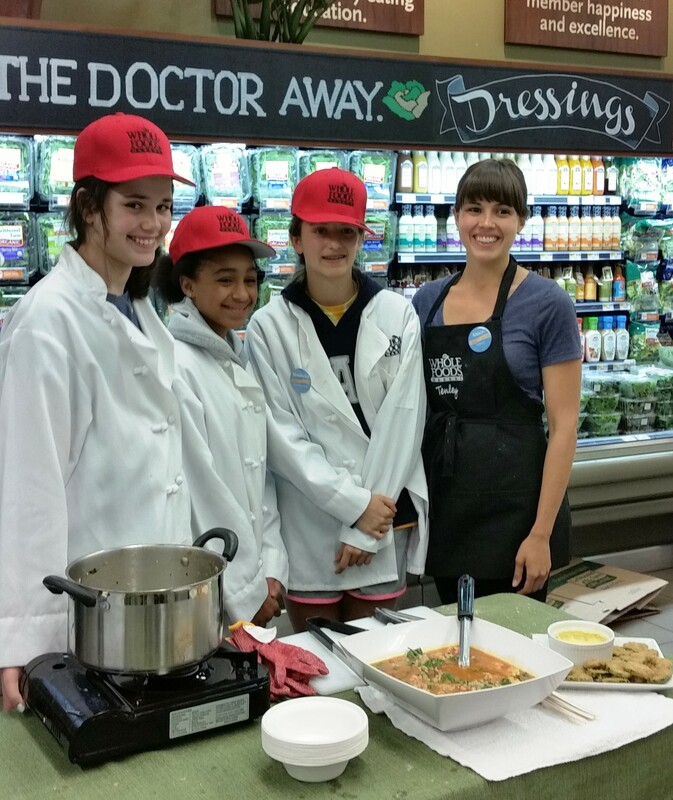 On Saturday, June 7 Whole Foods hosted the cooking club for a “Chopped” style competition. Leading up to the event, cooking club members competed in teams for a spot in the final championship, where one team would be named the winner. For the finals, three teams of three to four young chefs each faced off, tasked with cooking a dish of their choosing that incorporated three mystery ingredients – shrimp, shallots, and summer squash – revealed just moments before the competition began. Each team was evaluated by a panel of judges – two representatives of Whole Foods and yours truly – based upon the presentation, taste, and creativity of their dish, as well as how well the chefs worked as a team and how closely they followed good kitchen practices. The competition got underway in the produce section of Whole Foods, where three small cooking stations were placed amid the salad greens, melons and bananas, not to mention the usual crowd of Saturday morning shoppers. Adding to the drama, a cameraman from News Channel 4 showed up to film the chefs, giving the middle schoolers a taste of what it might be like to be on a real cooking show. As thrilled as I was to be part of the judging panel, I didn’t expect going into the competition just how talented these middle school students would be. When the secret ingredients were revealed they barely batted an eye, but got down to planning before heading off to shop the store’s aisles for the rest of their ingredients. All the teams remained focused throughout the competition and worked extremely well together, bouncing ideas off each other and their coaches, stepping in to help one another, and dividing tasks. Walking among the stations, I learned a few techniques that I’ll be using in my own kitchen. While the kids cooked, I had an opportunity to chat with some of their parents. To a person, they praised the club and said they wished they had opportunities like this when they were in school. Programs like the cooking club are fantastic motivators for kids, teach leadership and life skills and allow them to explore alternative career paths. And they are great for parents, too. One father of a competitor said, “I love to eat, but I don’t love to cook.” Fortunately his daughter loves both. She recently surprised him with a home cooked meal of ravioli when he came home after a long day at work. 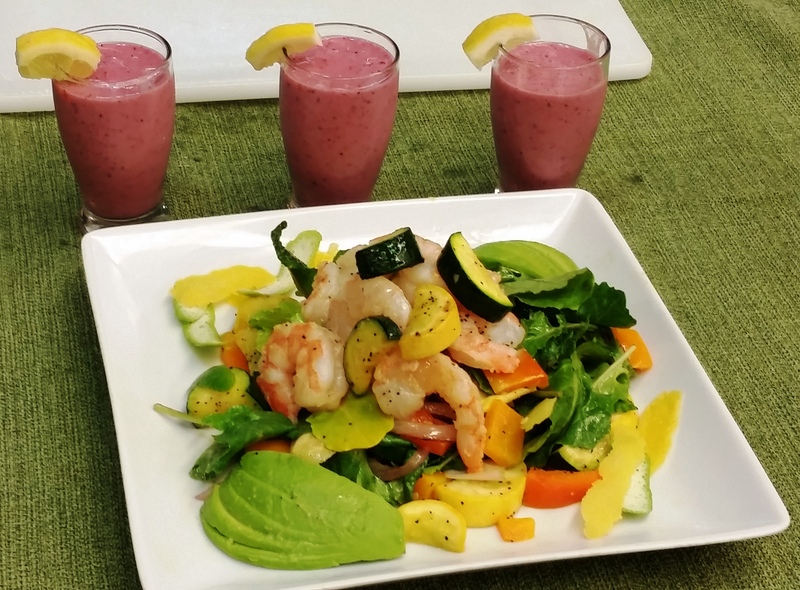 A shrimp salad and berry smoothie – A visual delight, with presentation to rival a restaurant, and bright flavors. 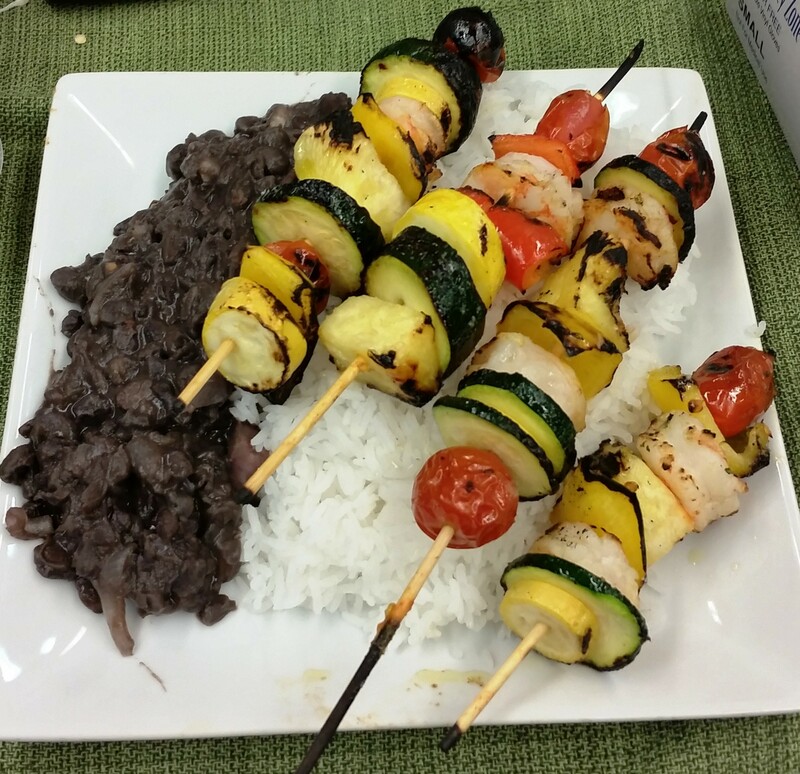 Grilled shrimp and vegetable kababs with black beans and rice and a tropical smoothie – The beans and rice had a great spice, incorporated the shallots in an unexpected way, and I could have noshed on them all day. 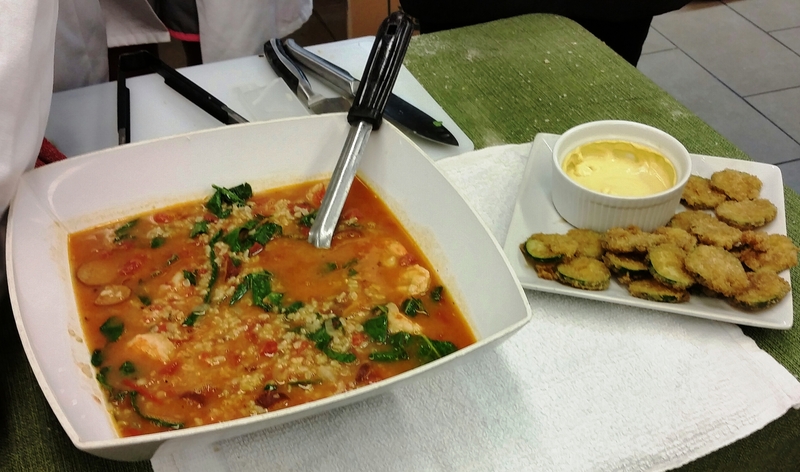 Shrimp gumbo and fried zucchini with a mustard aioli – Setting aside the impressive fact that most kids this age don’t know what an aioli is, much less how to make one, the gumbo had great flavor and the zucchini were addictive, with the aioli giving just the right tang. Needless to say, all three teams stunned the judges and it took some serious deliberation to select the winner. Ultimately, though, the third team who had prepared the gumbo came out on top. 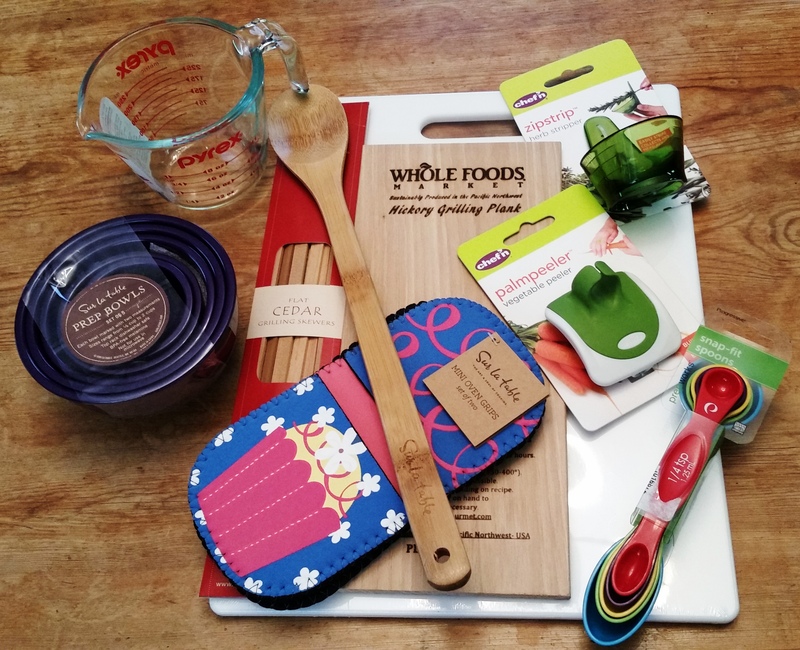 All the contestants received gift bags, and the winners received a selection of cooking gadgets, a gift certificate to Whole Foods and a personalized chef’s coat. But the real winners may be Whole Foods shoppers. The shrimp gumbo and fried zucchini are available in the store’s prepared foods section for the next two weeks. 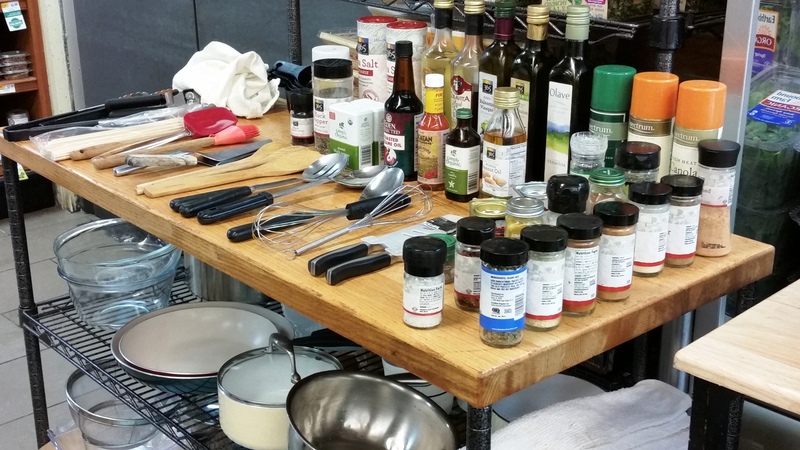 So you, too, can have the opportunity to taste just how talented these young chefs are. Congratulations to the winning team and their coach!